Take a stroll along a coastal path, waves crashing in the distance and the wind whistling through the wild grass, with this range of revitalising and fresh scents and this Sea Air Small Jar from Yankee Candle, part of the Coastal Living range of fragrances. The refreshing air at water’s edge laced with sea salt, cyclamen and rose. 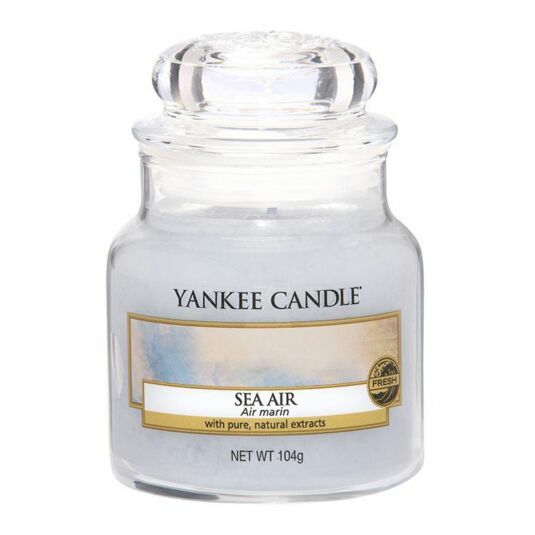 Top notes of sea water and salty ocean air mingle with middle notes of white cyclamen, rose and beach flower, finishing with base notes of sandalwood. This Small classic jar candle has a burn time between 25-40 hours and reflects a cleansing and comforting sense of style that’s brings the coastline to your cosy home, be it in the bedroom, the bathroom, the living room, or anywhere else you see fit. A fabulous gift for a friend or a treat for yourself. Refresh, relax and unwind in the tranquil surrounds of a coastal garden, as the sea air cleanses the senses, sea thrift gently sways in the warming breeze and the waves dance rhythmically as they meet land in this coastline inspired range of fragrance that will transport you to Britain’s best shorelines.